July 3, 2012 (Toronto) The media is invited to join Scotiabank Caribbean Carnival Toronto’s CEO Denise Herrera Jackson, local MPPs, city of Toronto councillors, and members of the Caribbean Canadian community for the releasing of information about this year’s Junior Carnival. For the first time in a decade the parade will not be held along Jane Street, it will instead be held in Downsview Park on July 21st. The Festival Management Committee, members of the Toronto Mas Band Association and The Organization of Calypso Performing Artistes, will be releasing key information about this year’s Children’s Parade and Carnival. As well children from several mas camps will be showing their new costumes for the first time! There will also be Junior Calypso singers, a dance group and steelpan performances. Why: There has been a major venue change and programme additions to this year’s Children’s Carnival. Because of traffic safety concerns and because of space limitations, this growing event has had to find a new home! Over 2,000 children in mas costumes are expected to take part in the parade, making it the largest children s carnival parade in North America. A Family Day Event follows the Parade until 8pm. 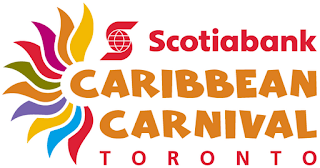 The Scotiabank Toronto Caribbean Carnival is an exciting three-week cultural explosion of Caribbean music, cuisine, revelry as well as visual and performing arts. Now in its 45th year, it has become a major international event and the largest cultural festival of its kind in North America. As Carnival is an international cultural phenomenon, the great metropolis of Toronto and its environs will come alive as the city explodes with the pulsating rhythms and melodies of Calypso, Soca, Reggae, Chutney, Steel Pan and Brass Bands. The Festival Management Committee oversees the running of North America’s largest outdoor festival. Corporate sponsors of this year’s festival include: Scotiabank, The Toronto Star, Sway Magazine, CTV, CP-24, FLOW fm, WinTV, WinRadio, General Motors, El Dorado Rum, The Canadian Federal Government, The Province of Ontario, City of Toronto, Tourism Toronto, The Greater Toronto Airports Authority, Ontario Place, Royal Ontario Museum, Ontario Science Centre, Toronto Public Library, Yorkgate Mall, Liberty Grand, and Grace Kennedy Foods. For more information about the programmes and events, please visit the festival’s official website at www.torontocaribbeancarnival.com. The Festival Office is NOW located at 19 Waterman Avenue. Contact info: Tel: 416-391-5608; Fax: 416-391-5693; Email: info@ torontocaribbeancarnival.com.